Another Long, Revealing Interview with Jake! HAHA, just kidding. Jake is none of those things in interviews, ever. (Except introspective.) But this is part of the reason why he is so great. Even though this interview is a joke, it is fantastic. He was quite a catch in his youth, no? Oh wow. It's Wayne Slalinski(sp?) before he shrunk his kids. I disagree, I think that video is very revealing...revealing of Jake's hot dorky side. Probably my favorite Jake ever. Totally love that LONG interview, what a completely lovable goof. That pic of him in what, maybe 4th grade? That is way too precious for words. Ooooh, it just makes me wanna hug him & squeeze him! 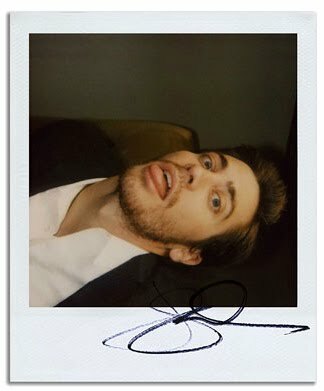 & OMG, that last pic, I wanna know WHO managed to take that Polaroid of him anyway??? One thing's for sure, that ain't no pap pic, woot! My copy of Highway just arrived in the mail...prepping to plop myself down and watch it. No I haven't seen it yet (yes, shame) but I'm excited. I'm also expecting Moonlight Mile from Netflix hopefully tomorrow. After which I'll have seen 98% of all Jake movies ever released. Yay Katie! Beep, perfect score, gold star! I have Highway waiting at home for me when I return in the USA and MM on netflix as well! I'm also in the 90% range for Jake movies. Here I sit at the other end of a marvelous trek through the films of Jake Gyllenhaal. I would say my favorites are still Jarhead and Brothers. But, and perhaps this is my bias talking, I thought Jake was amazing in all his movies. In Moonlight Mile, he was so adorable and so endearing and just MMM. I am a little upset about the Ellen Pompeo thing. (I've never EVER cared for her) Plus I loved the soundtrack. I completed my trek with Highway. It was undoubtedly one I was most excited about since I'm a huge Jared Leto fan. (not that it overshadows Jake in any way) It was such a different role for Jake (although different is sort of the common denominator of all his roles) but he was still so good. I can see why it made many of your Top 5s. Its one of those quirky movies like Empire Records I have such a fondness for. Katie, glad to hear you liked Highway, I also love Leto & have since I first saw him way back in the '90's, so I was really a fan of his before Jake's, (sorry Jake, but Leto is 9 yrs older). He is just so beautiful & can also sing, check out his band, 30 Seconds to Mars, although you probably already have since you're a fan of his. I posted a review of his band on my blog the other day if you're ever interested in reading it. I do believe my favorite scene in MM is when he says his piece at the table about burying his GF. That was priceless & perfect Gyllenhaal acting. & I so agree, he is amazing in ALL his movies. PG, that was also around the time he filmed his few scenes in Lovely & Amazing. Haha, loved "17" yr old Jordan! Too funny. I would have fallen for Jordan like Michelle did if he had come on to me that same way too... He was SO charming! 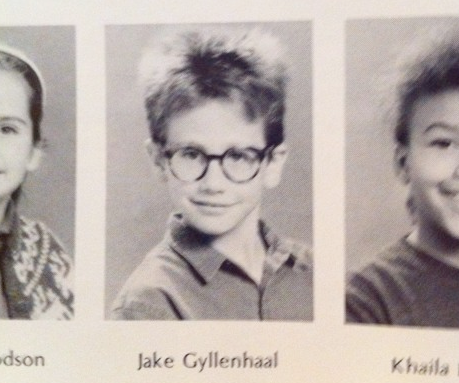 I think the school photo of Jake was around the time his father forced him to be a tube of toothpaste for Halloween.